In the same tournament I was watching the last games of a round come to a close and was treated to one of the most egregious examples of I Can't Lose From Here Syndrome I've seen in a while. 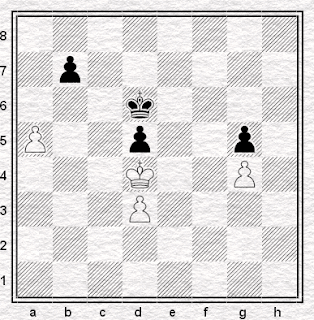 The position (the game, by the way, took place on one of the higher boards) was as given below, Black having offered a bishop exchange for a second time: White had been moving his own bishop this way and that in the hope of finding a breakthrough that wasn't really there. Resigning himself to the impossiblity of winning without swapping the bishops, he neverthless convinced himself that he was the only one with winning chances: after all, it was a pure pawn ending, and Black suffered from doubled pawns on the b-file, something which ought to be a crippling disadvantage in such an ending. and suddenly he realised that he had undoubled his opponent's pawns and conceded the opposition - and that it was his pawns which, in fact, had been immobilised. Actually to tell the truth, I don't know whether he realised any of that: he did however realise that he was completely lost, and while a few more moves were played, resignation followed hard upon. Perhaps one day I shall write a series for this blog about objectivity: which for our purposes we can define simply as not thinking your position is better than it actually is. There are all sorts of reasons why we do so: our strength relative to the opponent, the possibility that we were better, maybe even winning, earlier in the game, or simply the tendency, which is more and more pronounced the lower the strength of the players, to take far more notice of our own moves and ideas than those of the other side. Rowson calls this Narrative. We tell ourselves a story about how we're beating the opponent, and we consider the board in the light of the narrative rather than the objective truth. In the instance, it does seem to me that whatever the whole story, part of it was I Can't Lose From Here. But, objectively, you always can. I had my own doubled-b-pawn adventure a little later in the tournament, the very round after the missed-attack episode that I recounted yesterday. There's something about it which makes me cast doubt on yesterday's theory that I may have missed an attack on an opponent's rook at a7 because that piece was partially obscured by a queen on a6. What I think is mostly the truth, about yesterday's game and today's, is that I found myself concentrating so hard on the portion of the board where the action appeared to be, that I essentially forgot about the rest of it. 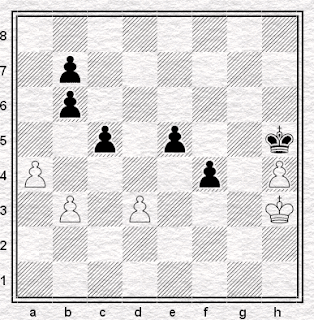 Gil Capape-Horton, Aragon Individual Championship 2008: position after White's 63.Kg2-h3. It may also be the position after White's 61.Kh3: if truth be told, my handwriting by that stage, four hours into the game, was so poor I cannot be sure whether or not the moves are as given below, or 60...Kf5 61.Kf3. Either way, it was clear to me that I had made a meal of a pawn ending that had looked easily won, just as I had nearly made a meal of the equally-easy queen ending that preceded it. (What would I have done, I wonder, after 44.Qf5?) 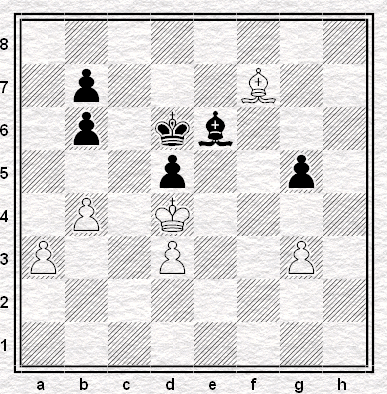 Black's f-pawn is too close to the White king to be of any use: and as White's king has access to as many useful squares as does Black's, it cannot be driven away. I was desperate. I had already drawn too many games and had to win this one if I was to get up among the leaders, but I couldn't see how to do it. The game had surely been won: but there was no way in for the king. I had just a couple of minutes left on the clock (and I only had those courtesy of my opponent having attempted to play 38.Kg2, thus gaining me two extra minutes from the arbiter). ....and forgetting all about a b-pawn that has, after all, been in precisely the same place for four hours and fifty-five moves. Until, that is, you look round the board just in case there's a miracle to be found, and discover that, Deo gratias, there is. Yup, I can lose from any position, even from a postion where Fritz tells me I have a 19 pawn advantage. 6. cxd5 Nxd5 7. Bxe7 Qxe7 8. Nc4 e4 9. Ne2 Qb4+ 10. Nc3 Nxc3 11. bxc3 Qxc3+ 12. 25. Rxd3 Qf5 26. Red1 Re6 27. d5 Rg6 28. Qh2 Rd8 29. d6 Rd7 30. R3d2 Re6 31. 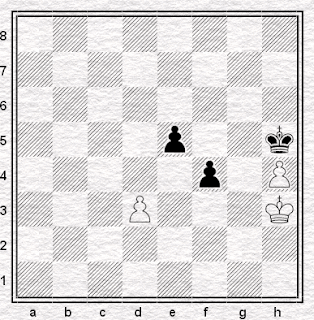 It's very similar to your first example: after 39 moves, I'm completely won, it's trivial! 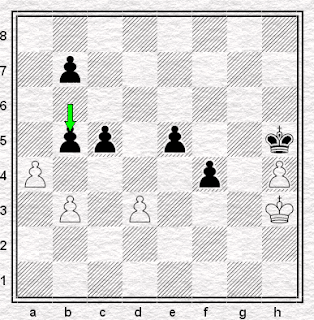 Not only do I have a passed pawn on the d file and 2v1 on the Q side, I can easily block the K side pawns. Why is my opponent playing on ... is he taking the Mickey? (I have 15 minutes left on my clock). That last point is a good one, I think: we often think we're lost when in fact, there is still play left in the position. How do you solve the problem - with Sofia? Improving the Image of Chess?